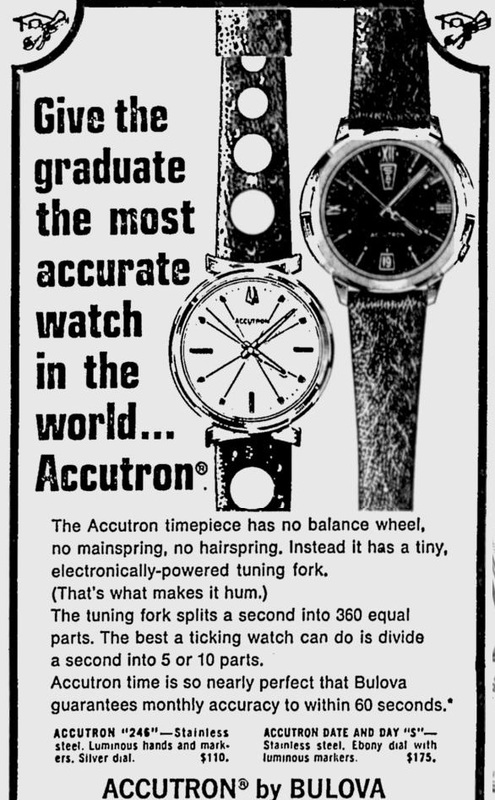 Bulova 1969 Accutron Date & Day "S"
Welcome Brian on myBulova, your watch may be Date and Day "Q"
That's interesting but the cystal is round with an oval bezel. The oval is wider as opposed to taller as it appears in all the other types of watches I've seen from this period that look like mine. Bria, that is just a warping of the original photo. The actual watch is round as is yours. I agree with jabs, Day Date Q. My watch is not round -- the cystal is round but the metal case (or what I called bezel) is actually oval -- it is a wide short oval not a tall narrow oval. It's very subtle and doesn't really show in the photo I posted. If the crystal is round, how is the bezel oval shaped and still fits the crystal? the outer edge of the case is oval but it has a round cut-out for the round crystal. Perhaps I'm using the term "bezel" incorrectly. Hello Brian, welcome to myBulova. I like your watch. The day and date arrangement (vertical as opposed to horizontal) is unusual, Bulova didn't make many watch models with this feature. I think everyone is saying the same thing. The portion of the case that slopes away from the flat spot around the crystal is not carried all the way around the crystal, it's tapered away where the lugs are attached. I might say it this way..... the CASE is oval and that the flat spot around the crystal (bezel) is round. 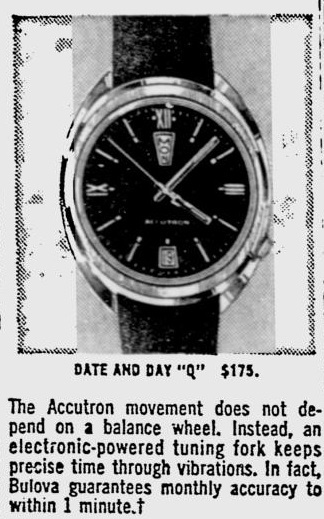 Having said all that I agree with Jaroslav, that this watch is an Accutron Day and Date "Q". I see a match to the advert. That sure looks like my watch!!! It always appears to me to have a navy dial with blue numerals but it could definitely be an ebony dial with blue numerals. My father purchased this watch new -- I think in the Bahamas while on vacation -- and it had a navy leather band with white stitching along the sides. It also had oval cut-outs that I think were also trimmed in the white stiching but I'm not sure. I would LOVE to find a working original strap for this watch. My father gave it to me several years ago but this was the watch he always wore when I growing up. Thank you for helping me to identify this watch!